Mykonos (Gr. Μύκονος) is the picturesque island of Cyclades, which is located in the heart of the Aegean Sea, with an area of 85.5 km2 and the coastline is up to 89 kilometers. The island is a popular bohemian resort that wonderfully combines the landscapes of pristine nature and the glamour of fashionable life. The administrative center of the island is the town of Chora, it greets visitors with its traditional Cycladic architecture and modern infrastructure. Here is located the main sea port of Mykonos, in the harbors of which you can seen the little old fishing boats as well as huge luxury yachts. If you have ever seen a postcard from Greece, you certainly find on it old stone mills – a kind of a landmark of Mykonos. While approaching the island by ferry-boat, the first thing you will notice is silhouettes of huge wind mills. They no longer work, and are converted into traditional taverns and souvenir shops. А typical Mediterranean climate prevails in Mykonos. There are more than three hundred of warm sunny days a year, precipitations are very rare and it rains only at the end of winter. Cool breeze from the Aegean Sea, which the islanders call “meltemi” helps in hot weather. 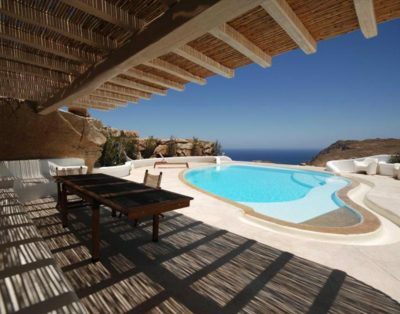 The architecture of estate in Mykonos is very distinctive, even for the island part of Greece. All the buildings are similar: white stone houses, often with a domed roof, painted in bright blue. Externally, the luxurious cottage may differ from a modest chapel just by the shade of blue paint on doors and windows. 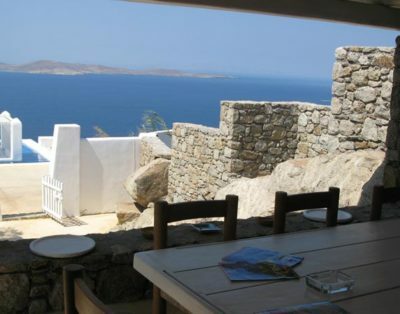 Buying a property in Mykonos is a reasonable and profitable investment. You can not only relax in the warm season, but also to live permanently. 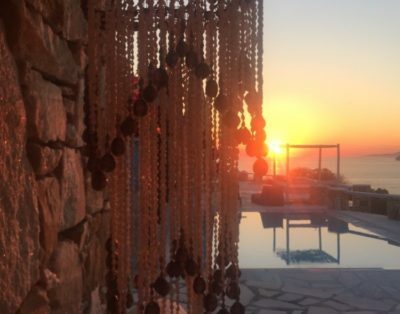 By buying a house in Mykonos -you get the opportunity to enjoy the spectacular views and enjoy the unique atmosphere all the time.